On this page you will find some kids party food ideas. Kids birthday party food can be hot, cold, a meal, a buffet or simply fruit and cake. We find it easier to sort a budget before we decide on party food. If you need a frugal party then aim to have a party between mealtimes and then serve ice cream and birthday cake. Don't feel you have to produce an amazing birthday cake either. 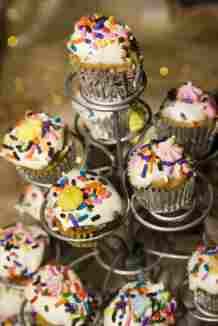 We have had birthdays with the kids decorating cupcakes as a party activity. These are then placed on a plate in the centre of the table and they go down well in place of a cake. You have the added bonus of not having to cut a cake. Don't forget about food allergies, check with the parents of your kids guests. You could add the question to the invitation. Hot sit down meals can go down really well with kids. You can then choose to cook it yourself or buy it in. Tacos with a choice of fillings. Mcdonalds or Kentucky fried chiken. A great favorite of our kids has been pasta with a sauce and pizza on the same plate. Garlic bread can be served on the side. Chocolate fountain see if you can borrow one if you don't have one, the kids love them, they can dip in pieces of fruit, marshmallows, cookies etc. Serve food on silver trays with doilies, pour drinks from a teapot, use mini cups and saucers.